Over the decades, Snow White has survived everything from poisoned apples to the sugar shock of Disney, so does anyone imagine the girl can't bounce back from the clutches of The Ratner Touch? 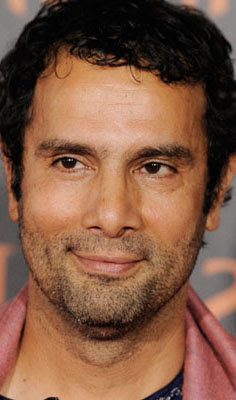 You'll notice that I credit producer Brett Ratner, rather than director Tarsem Singh (shown below), for the not-quite-disaster-but-close-enough-for-jazz mess that is MIRROR MIRROR, one of the two live-action versions about Ms White that are due out this year. 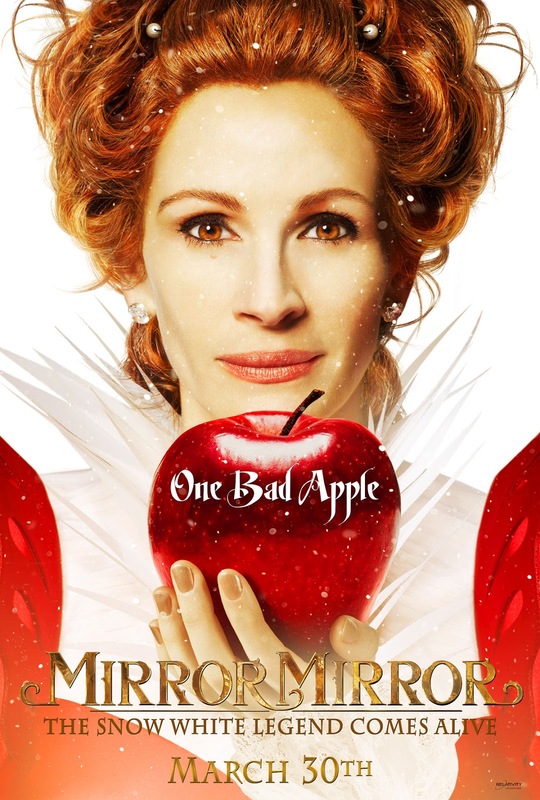 Mr. Ratner, whose theatrical products are usually taste-free, comes through again with a movie that attempts to update the Snow White story (while keeping it firmly in storybook-land) but entrusts the screenplay and screen-story to several, shall we say, lesser lights in the Hollywood firmament. 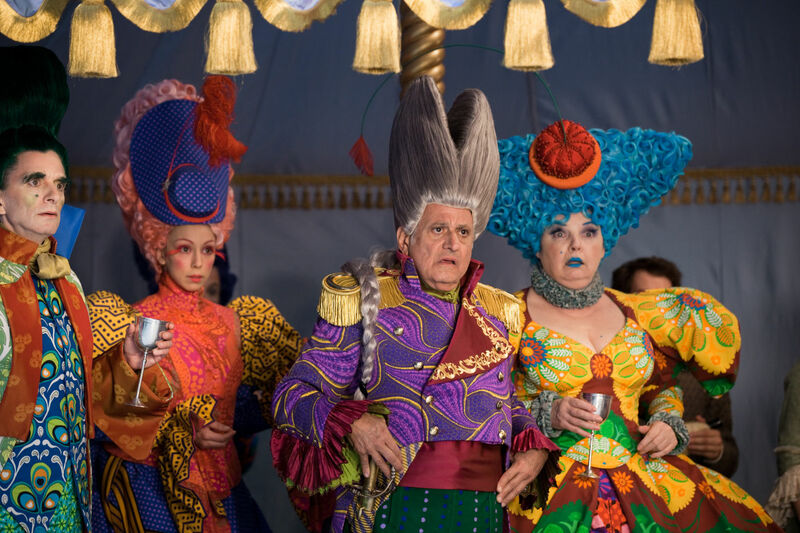 The result is a wit-free 100 minutes, in which the laughs come from typically clichéd situations, as we view some of the most chintzy-looking sets and costumes to be seen in a supposed big-budget Hollywood movie in years. Wait till you get a load of Snow White's wedding dress: ugly and then some -- and not even white. (Is this a way in which to subtly tell us that the bride is not "intact"?) Whatever: All these accoutrements (note the still just below) exhibit the kind of heavy-handed tastelessness that can only come, I fear, from the directives of the fellow in charge. Given what Mr Singh has done with his former films, I suspect that he was not fully in charge this time around. While he has made only one really terrific movie so far (The Fall, in which his amazing visuals were set against a crackerjack story, deeply felt), his other movies (The Cell and the more recent Immortals) whatever else they might exhibit, were visually very smart. 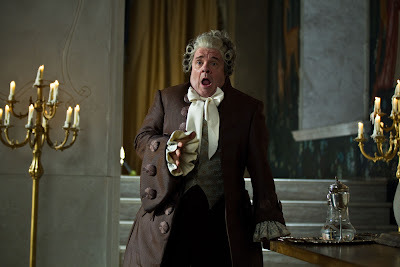 What little humor to be found comes mostly from the ever alert Nathan Lane (above), who makes his so-so dialog sound almost like clever zingers, and from the much appreciated professionalism of Julia Roberts (poster, top) as the wicked queen. 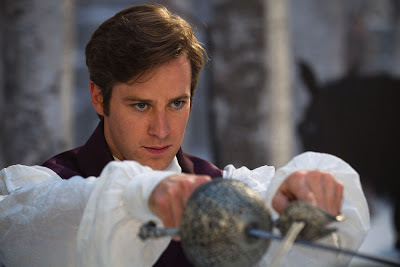 In the role of the prince, Armie Hammer (above), handsome as ever, descends yet another notch from his good work in The Social Network, below even his so-so turn in last year's most boring film, J. Edgar. 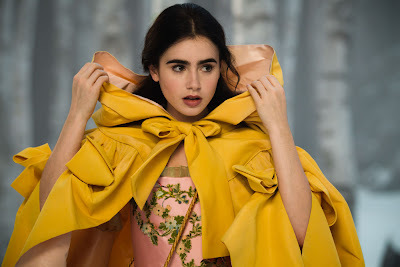 The character of "Snow," as she's referred to throughout much of the film, is played by Lily Collins (below), who, despite her overgrown eyebrows, has some of the beauty of the young Elizabeth Taylor. You may, as have I, mixed her name up with that of Lily Cole, an also beautiful but more interesting actress (Rage, and the upcoming Moth Diaries). 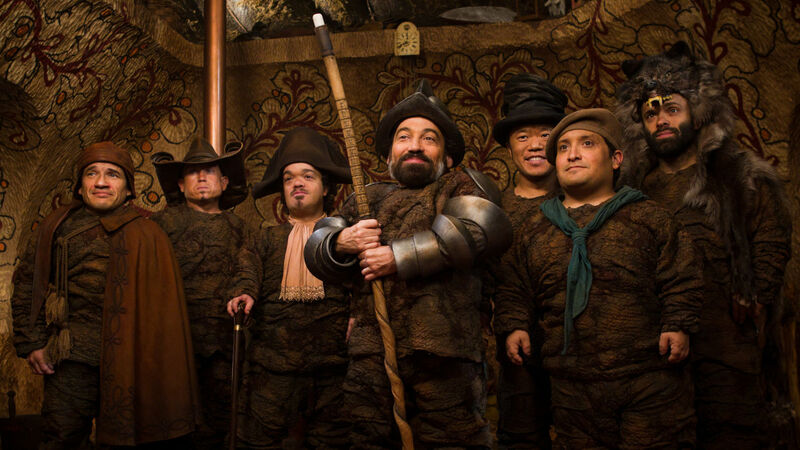 The movie's ace-in-the-hole (more like a jack-in-the-hole) is its dwarf contingent, played here, below, as funny, hungry, horny little people. The guys are good. But with better material, they might have been terrific. Oh, well. Young kids -- having seen many fewer films in their lives than we jaded critics -- will probably love it. Mirror Mirror opens this Friday, March 30, across the country in a theater (probably several) near you. To locate one now, simply click here, then enter your zip code under GET TICKETS at the top left of the screen.